Not an ITA Member? No worries! 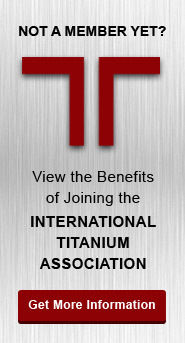 You can still access (for free) many areas of the website including the online technical library, past conference proceedings, issues of the Titanium Today magazine, and more. Simply Click Here to Register as a Non-Member. It Takes Less Than A Minute And You Are On Your Way. Click Here! If you are an existing Member of the ITA, please enter your username & password below to access ITA Member features of this website.